First the avocado came home, followed by the basil and then the almonds were discovered in the freezer. 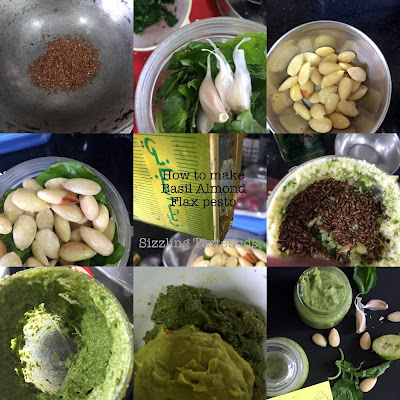 Considering these are expensive ingredients, I wanted to make an exotic dish, and Google helped with this pesto from Radhikas's blog when i asked "Basil + avocado + almonds". So this dish happened in reverse. Also that almonds (and most nuts for that matter were rich in protein helped me dovetail this dip into this theme for the Mega BM). So, there it was : a delicious pesto that went very well with our Dominos style homemade garlic bread. Yes, it was a garlicky overdose but then the elder kid and the husband - both great fans of garlic - enjoyed the meal. You may also use this pesto to make sandwiches, frankies (a.k.a rolls) wth sphagetti or even my savoury pull apart rolls or even the pizza pinwheels. The list is endless. So, go on and make a batch and enjoy your meal with the delicious vegan and GF pesto. In a food processor, add all ingredients except half of the olive oil, lemon juice and the basil. Grind to a smooth paste. Add the basil, a handful at a time, with 2 tsp of olive oil for each batch. Grind in spurts and add the lemon juice immediately. Add the basil only at the end, else the pesto will turn darkish green and unattractive within a few hours. Add lemon juice also at the end, stir well, and store immediately in an airtight glass jar to prevent oxidation. Olive oil indicated above is enough, however a tsp or a little more wont hurt. 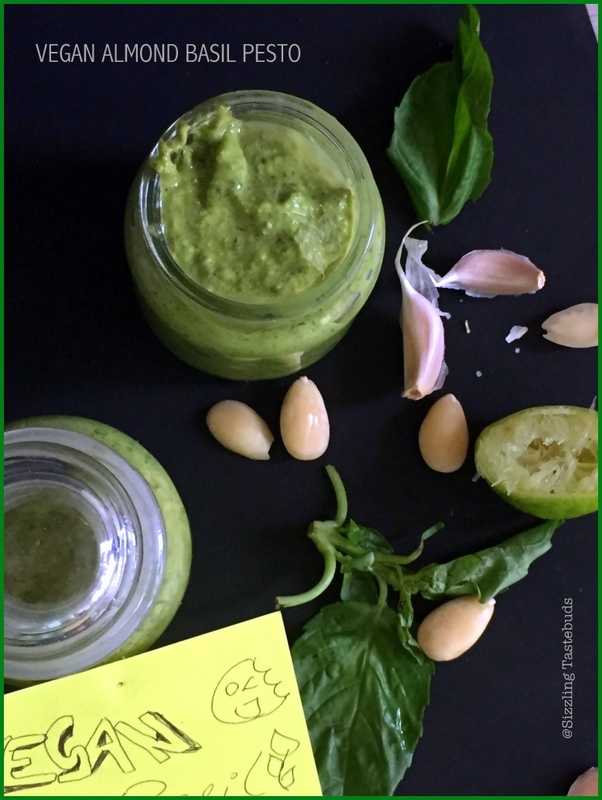 Lipsmacking here, such a flavourful and very nutty pesto to relish with some pasta or bread slices. Loving it to the core. Basil is my weakness , I can eat anything cooked with it . I love its aroma and flavor , trust me I feel taking a lick from that super rich jar . I must try this pesto with almonds , going off the traditional pine nuts . Super pick . This is a wonderful flavourful pesto Kalyani. We don't get basil here, so haven't yet tasted it, but by the looks of it, this one is surely a delicious pesto.. I am yet to cook with Avocado though I have made pestos with other ingredients..this is one super rich sauce! Pesto gets a nice makeover with the addition of almonds.. I am a garlic fan too. This pesto looks so inviting and flavourful. The tag is lovely, kudos to your daughter. As Vaishali mentioned, I too love basil leaves in any form. The vegan pesto turned out super nice and all I need is some pasta to finish that off. The pesto looks so good and it would have tasted awesome with that garlic bread. So nice of kiddo to share a jar with her fried,nice tag btw. So you know what gets in line next? I am in the process of emptying my fridge and refilling it. :D Love the dip Kalyani. Love the aroma and nutty flavor in this sauce and addition of almonds makes it very easy recipe compare to pine nuts. That's certainly a different kind of pesto. I would love to try it out. Lovely color too. Love this pesto with flax seeds and almonds. I make these pesto without parmesan cheese too. Love this version. Great share. One such healthy pesto,got a lovely color..
wow! 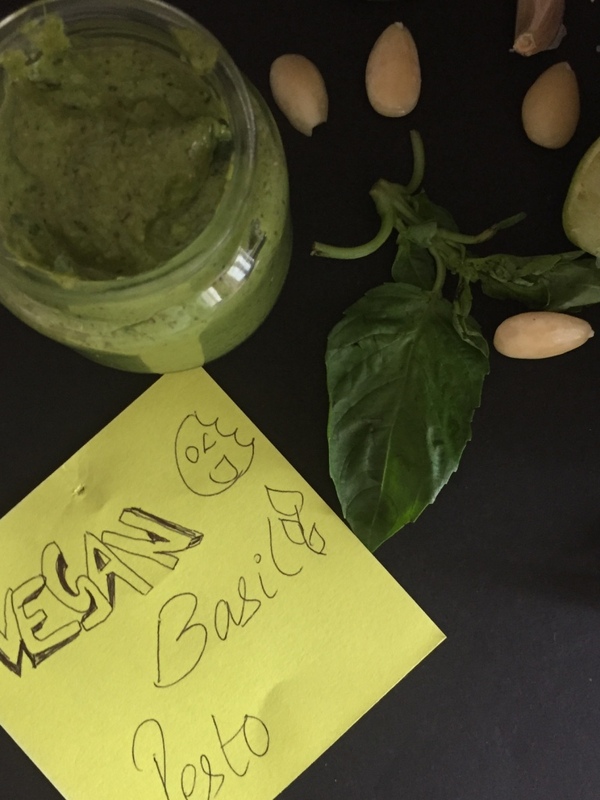 nice vegan pesto recipe. Addition of almonds is interesting!